Karina and company look like they were all in fine form and happy at her Joonbug Party in New York City. Below is one pic. More at Zimbio including some with Season 12 partner Ralph Macchio. Isn’t her dress gorgeous? Be sure to tweet her a Happy Birthday tomorrow. We can’t forget about Kym and Cheryl beautiful as always as well. They are bringing in the new year in Australia. Check out Allison Holker, Chelsie, and Louis (in the background) in Cabo San Lucas. I’m not sure who the guy is on the right, but, he’s got nice TEETH? Here is Mark Ballas celebrating in Las Vegas with the Kardashians. More pics at Haute Living. Below is a picture of Dmitry, Anna, and Jonathan in Cabo. More pics of all those in Cabo at Dmitry Dream Team at Facebook. 22 responses to "Our Dancing With The Stars Pros Celebrate The New Year (Photos)"
So cool to see all this! Thank you! 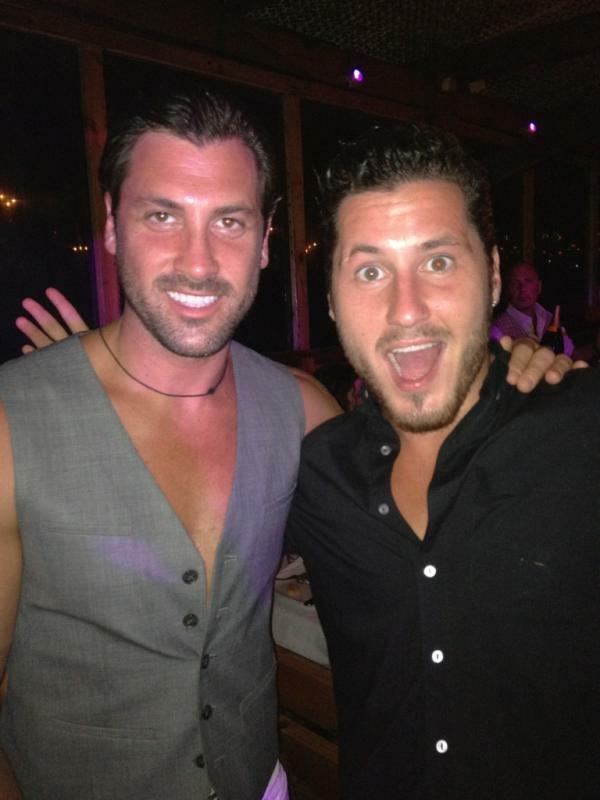 I love Maks’ vest without a shirt look. XD Also love Chelsie’s cute jumper and congrats to the happy couple!! YW Rory!! 😉 Happy New Year!! I love Karinas dress, but that picture is gawd awful. I can hear it now, “Oh Karinas looks wasted”…. Does anyone think Ryan will ever commit to Julianne? 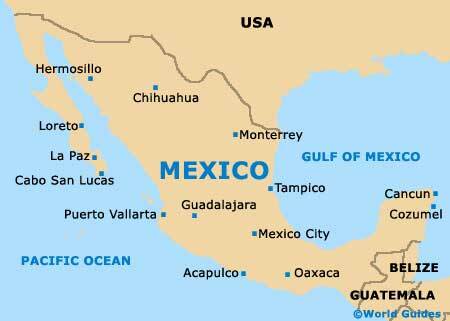 But its great to see everyone having such a great time and ringing in The New Year..
Where is Cabo san lucas? Sandy, no i don’t think he’ll ever commit to her. HAPPY NEW YEAR XD!! Vogue, I thought at first that was Louis Vito next to Chelsie and he got a haircut!! But then I saw LVA in the background. I think that might be one of Chelsie’s brothers. I love seeing all the NYs pics of our dancing pros! i think I’d love to be down under with Kym and Cheryl…. and is Karina holding a bottle of champagne and a bowling ball?!?!?!?! In the picture of Allison, Chelsie, and Louis from Cabo, I believe the guy on the right is Chelsie’s brother, Jordan. 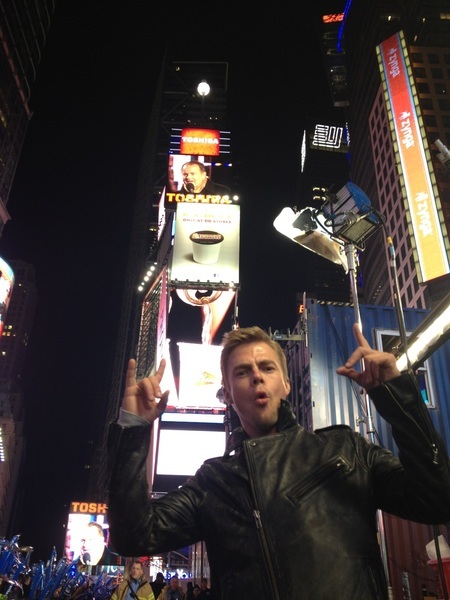 Love all of the photos of the pros ringing in the new year! So nice of all of them to tweet them out for the fans. Love the shots of New York! 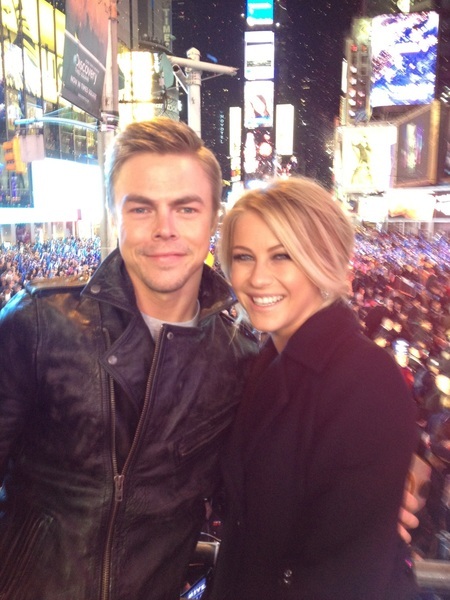 Derek & Julianne really seemed to be having a great time in Time Square!! To an amazing year! Let’s go 2012!! Happy New Year to all of you at PureDWTS!!! May you all have a joyous, prosperous and safe new year!!! Thanks for all that you do!! What great pictures! Thanks for posting them and for always doing such a great job at Pure DWTS! I just wanted to wish everybody at Pure DWTS and DWTS fans everywhere a wonderful and happy 2012! P.s. does dmitry have a cast on his wrist in the pic of him anna and jonathan? Someone who works at Z100 NYC said that RS is totally smitten with Julianne—who knows? Didn’t realize there was such a big age difference between them though, but they seem happy. Mark was in Vegas with Kim K (he oddly hangs around with her a lot these days—needs PR for new cd perhaps lol). Forgot….Derek then partied at Lady Gaga’s “Joanne”…guessing he had the most fun lol. @Sheery – Maybe Lady Gaga will open a business in our town as well. And maybe some DWTS alums will be here in my town too!! Wishful thinking, I know, but I got carried away. 🙂 Lady Gaga supposedly purchased a home here, but I think it is more as a getaway and not to be in the public eye. Her boyfriend the actor Taylor Kinney, graduated from one of our local high schools. Goodness gracious, big news around here, most of us are country folks. Sorry that I got somewhat off topic here. Yes, I wondered if when Derek tweeted “good job, Jenny” he was thanking her for bringing her “Playmate” friend (the brunette in the pic) alongwith her for the NYE festivities. Anyway, looks like everyone had some fun! I believe that is Allison from SYTYCD in the photo with Jonathon & Dmitry, not Anna! Per her tweets, she is there as well. Are you sure Dee? Being her hair is shorter and more red, I thought it was Anna? Allison is in the 6th photo though for sure. I didn’t really think that was Anna either! But, i don’t know allison that well, looking at the picture it could be either of them really. The way the light is in that pic, it probably makes her hair look red. Looking at the pcitue again, maybe that is Allison. Good noticing Dee! !